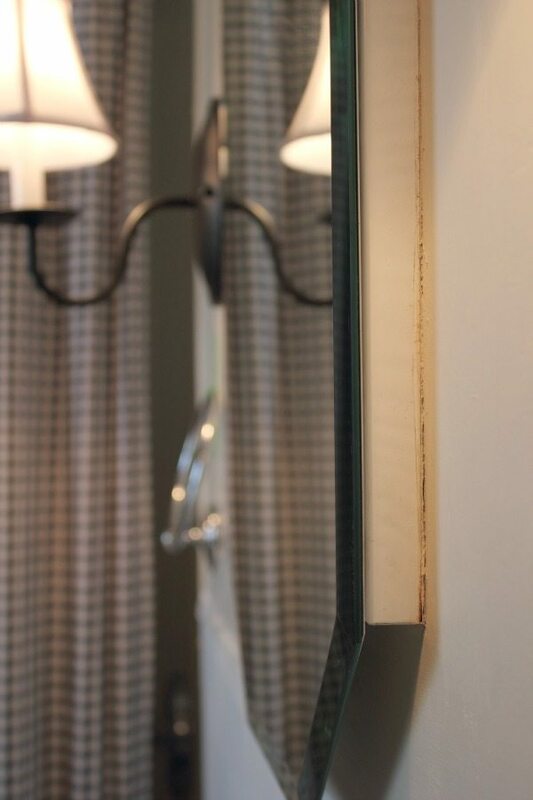 I’ve been working on a really quick little bathroom update for the last month or so, and of course, like on any project, there were lots of little imperfections. 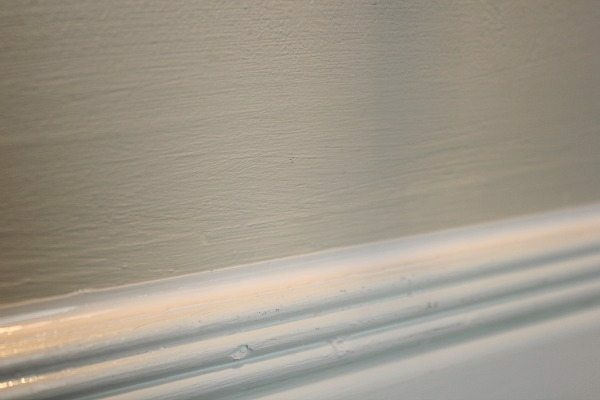 I learned a long time ago that caulking is your best friend for filling gaps and covering up mistakes, especially in an old house like ours where nothing is square. I thought I knew what I was doing when I started, but I found quite a few little things that made the job easier and look a lot better in the end. So I thought I’d share! 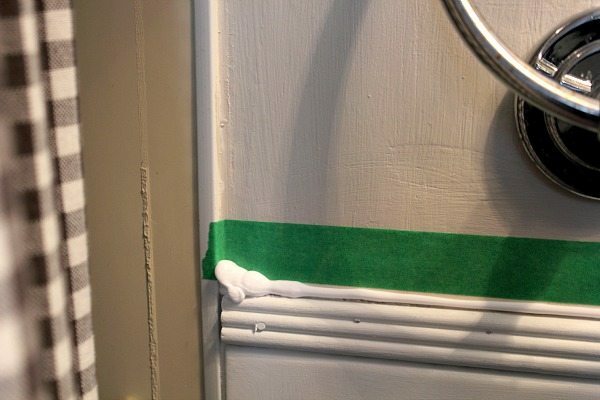 First of all, there are two ways that you can do your caulking: before painting and finishing, and afterwards. Since I’d already done my painting and was just trying to cover up the yucky bits, I chose this silicone because I liked how it said “permanently WATERPROOF”. That’s gotta be a good thing, right? The only thing with this type is that it’s super slick and shiny when it dries and doesn’t do very well if you try to paint over it. For this though, it was perfect. The first time I tried to use caulking, I cut the little tip off and then couldn’t figure out why I couldn’t get it to work. Turns out there’s also a little membrane inside that you need to pierce. There should be a little piercer sword that swings out of the bottom of your caulking gun for that. P.S. Isn’t my new bath mat neat? So here’s a little look at some of the “before” shots. I had to remove a whole lot of wallpaper and little bits were left on the edge of the tile there. Also these old walls are in pretty rough shape, but they won’t be replaced until “bathroom reno 2.0” happens, so I thought I’d just try to make the whole thing look more presentable by covering up what I could. Not nice. We’ve got to make this better. But how? This is what I usually do when I do caulking. I lay down a thin bead and then use my finger to smoosh it until it’s smooth. Two things are wrong with this: 1) If you read the tube, you’re not supposed to actually touch the caulking with your bare skin. Oops. I got a latex mechanic’s glove that I found in my stash of tools. This made it pretty hard actually cause the glove was way too big. I usually have smaller gloves around, but I ran out, so I ended up using my finger anyway. Bad me. The other thing wrong with this approach (2) is that it didn’t end up looking so great for an after paint job kind of finish. Especially not when you’re on the boarder of two different colors. There was kind of a lightly blended shiny white line instead of a nice crisp clean line. But I learned! I took the same approach as I usually take when I do something like a bath tub and I taped off where I wanted my line to end. 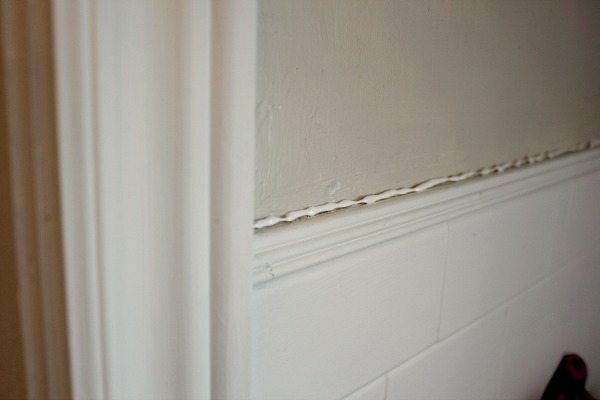 Then I put down the bead of caulking (sometimes, I put a bit too much, obviously) and smoothed it out. 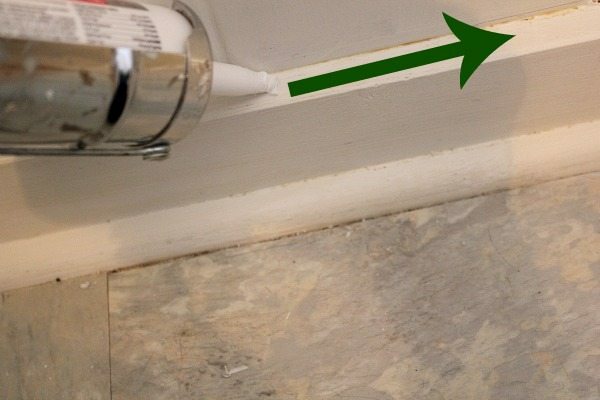 If you’re looking for a really good explanation of how to caulk a bathtub, by the way, my friend Ann did a great post on that a couple of weeks ago. I do it almost the exact same way. Now that’s more what I was looking for! All those little bumpy bits have totally disappeared! 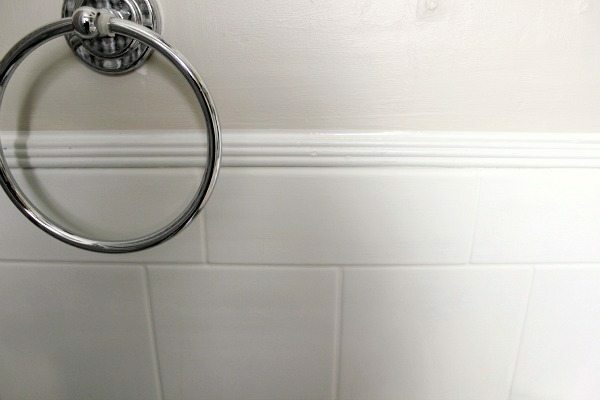 A lot of people only think of using caulking on things like bath tubs, sinks, and windows, but you really can use it on just about any DIY home project to get a nice perfectly finished look. Here’s where my mirror meets the wall. It was just looking not so clean and newly refreshed. You’re just getting all kinds of sneak peeks of this bathroom today now aren’t you? Okay, I ripped a little of the paint off along with the tape. Oops again! Easily fixable though when I go through and do my last few touch ups. One last little revelation I had: When you’re laying down your bead of caulking, you want to move in the same direction as you’re squirting with your gun. So that means that as you squirt a little out, you immediately smooth it over with the tip of the gun. It sounds counter-intuitive, but it really makes for a lot less waste and a lot less mess. I’ve always felt like I should put down a perfect bead and then smooth it after, but there’s not need! It makes for a lot less unhealthy finger smoothing afterwards too. 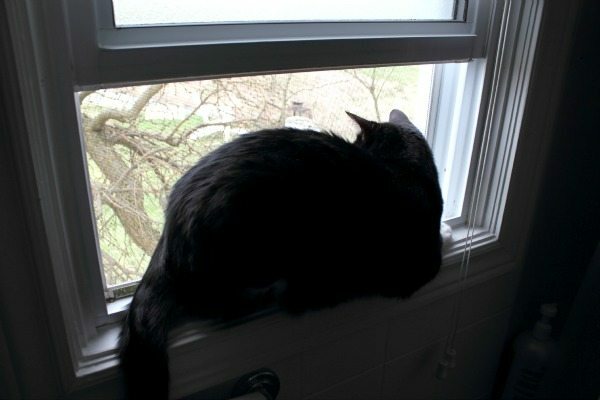 Don’t forget to open a window as well while the caulking is curing! This was a new one for me too, I have to admit. Oh the things you learn when you actually read the packaging, right? Great tips! 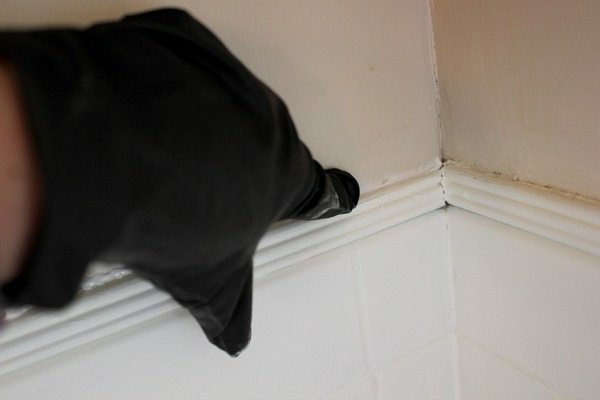 We need to do some caulking in our bathroom too – so this comes at a perfect time! Love the tape idea! I love all these tips! I really need to do some of these and now I know a great easy way to accomplish it. Thanks for sharing. That tape is such a brilliant idea!!! Thanks for the tips! 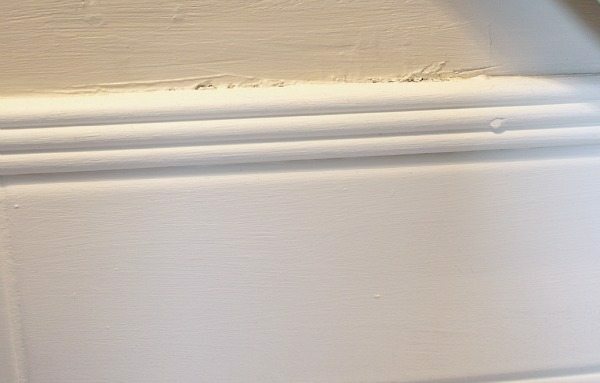 I just painted the area above the chair rail in my dining room a dark color and you can see the wobbly paint line, so I need to caulk it. I’ll be using these tips for sure! Great tips girly! I remember helping my dad do this in his house as a kid. But we were bad we used a wet finger no glove whoops! Great tips, Courtenay! 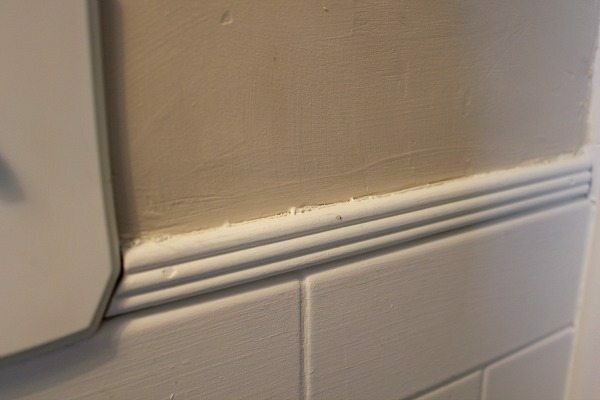 Caulking really does help give a finished look. 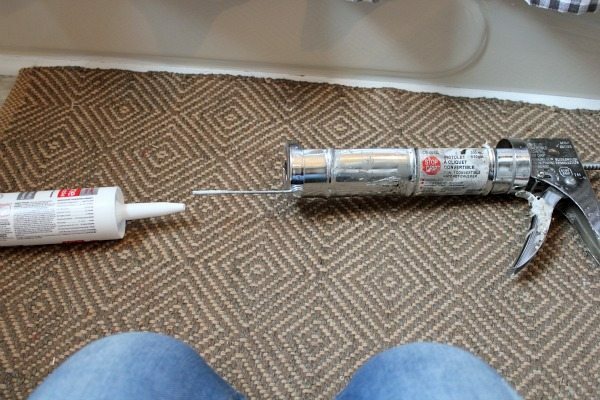 For a second there, I thought you might start caulking the cat! Whew! You’re so handy!! Now I’m looking at the corners in my bathrooms and realizing how badly they need a little fix haha! Thanks for this post, it’s so helpful!! I always learn so much from you. I had NO idea that the caulking gun had the “little sword” thing. I have really bungled up caulk tubes trying to pierce that membrane using all kinds of crazy things. I feel positively liberated! I always learn so much from you. I had NO idea about the “little sword” thing on the caulking gun and I have really bungled up some caulk tubes trying to pierce that membrane. I feel positively liberated! Ah caulking. Can you believe I only learned about it two years ago, *after* painting all the walls and trim in our first house?! What a difference it made when I went back and caulked the seams! Love this post! The tip with the tape is fabulous, thank you! As my handy husband says, “I little caulk fixes anything”. Every time we do a project and things start looking a little funky he assures me that it will all come out looking flawless when he is done caulking. He never disappoints me! 🙂 Loved the caulking tips and I’m thinking that maybe I should practice caulking more myself…nah…he’s got it perfected lol! I learned from a carpenter to cut the tip of the caulk off at an angle so you get a more flush line coming out of the tube. Much much less smoothing with fingers is necessary this way if any at all. Great tips! Thanks for the great tips. I love to learn from those who have done it wrong first and then figured out the best way! LOL. I’m writing a post on transforming a bathroom for under $500. 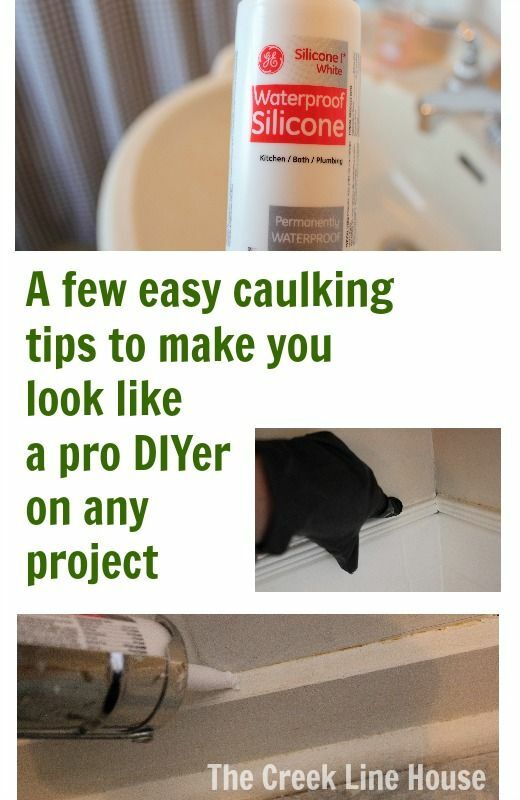 I’ll link to this tutorial for the part of my post that discusses caulking. Thanks again! Best caulk to use interior and exterior is Big Stretch by Sashco. 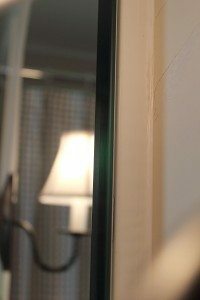 It is an elastiometric caulk whick stretches up to 400%. Comes in many colors. 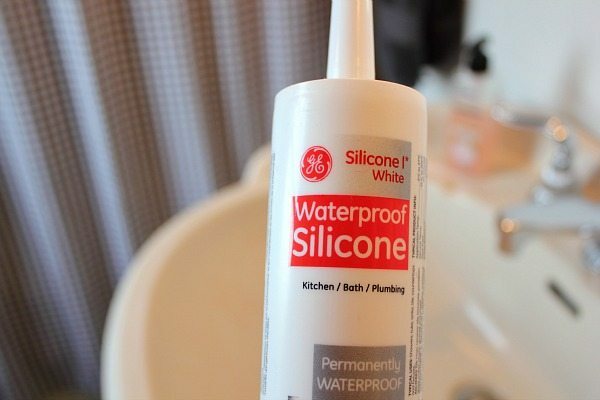 Use it once and you will never want to use any other caulking again. My Lowes sells it for about $7 a tube but I’ve found it on Amazon for $5.50. Also for places you use silicone for (wet places usually) try Lexel. It’s alot clearer than silicone and it’s paintable as well. I find that if I cut the tip at an angle and push the caulk it is rounded by the tip and forced into the gap. I like how you said that caulking is your best friend for filling gaps and covering up mistakes. We are redoing our bathroom and are thinking of filling in the new bathtub with caulk. Thank you for the caulking tips.